"Summer's End," an oil on canvas by Rudy Eccher, stands out in the Four Corners Commission Show at the Durango Arts Center on Monday. If plein-air is the sort of thing you like, the Four Corners Commission Show is the sort of thing you'll like. The juror of the annual show at the Durango Arts Center, Veryl Goodnight, is a plein-air painter herself. You will, however, probably know her better for her bronze horses that have grazed Main Avenue for years. It's the show's 13th year after being founded by local artist Ed Kruse to show the work of artists inspired by the landscape of the Four Corners. Fittingly, Kruse has a sketch in the show. More than 180 pieces were submitted, a record number for the show, said Heather Leavitt from the arts center. Goodnight chose 89 works to display by 61 artists. Plein-air paintings form the bulk of the exhibit and were chosen by Goodnight for the two top prizes. She picked Mar Evers' self-described oil "Sandbar & Sunshine" ($1,800) for the top award. Evers was one of the few artists who got all three of his paintings into the show. So did local favorite Karyn Gabaldon, whose tall, scorching green, mystical acrylic "The Light Will Guide Our Soul (Spud Lake)" ($1,400) shone from across the room. This artist certainly can write picture titles. Erik Nelson, a recent Fort Lewis College graduate, also made it into the coveted three-paintings category. 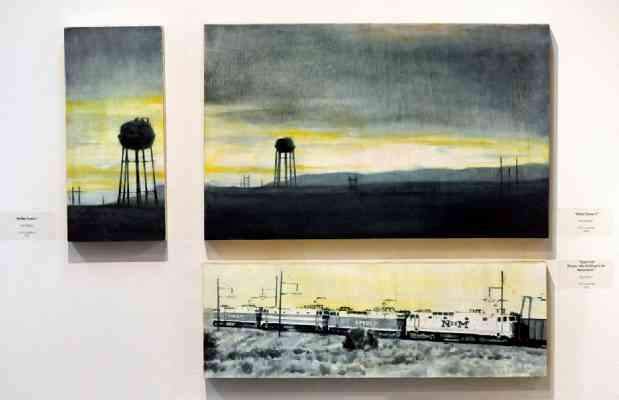 His wistful companion paintings "Water Tower I" and "Water Tower II" hung above "Coal Train (Empty Idle Waiting to Be Relocated." With his restricted palette and the melancholy rural subjects, they may be the first of a school of Recession Art that will emerge if hard times continue. By complete contrast, Rudy Eccher's pastoral oil "Summer's End" ($2,300) almost bounces out of the frame with its beautifully startling colors and strong structure in the trees and the shadows. This picture got my vote for the People's Choice Award, but it wasn't an easy decision among many beautiful works. Goodnight's second-prize choice also has an up mood. Lorraine Trenholm's "Twilight Jewels" shows a town sparkling from a high perspective far away. The Durango Chamber of Commerce went traditional with its choice of Jane Mercer's autumn scene "Height of Color" ($2,700). Besides the plein-air paintings, the show is heavy on photographs at reasonable prices - many around $100. Many of the photographers have gone for subtle silver gelatin prints in black and white. An exception is Bethany Powell's "Slot Canyon" ($900), in which the incandescently orange canyon walls leap from the black ground. Durango watercolorist Ann Smith shows an accomplished and desirable bunch of wildflowers. One of the two artists who stray toward the abstract is Louise Grunewald, who has concocted a tiny "Fantasy Canyon" with watercolor and colored pencil. The other, the one you can't miss, is Rachel Alber's 6-foot-high cottonwood sculpture "Wing in the Light," which she's priced at $10,000. 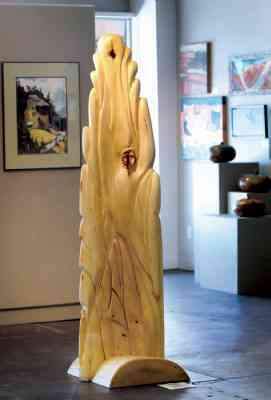 She's carved the pale wood in relief and let two knots pop out to gain all the attention. Marilyn Kroeker also works with wood in her watercolor of driftwood "Anima of the Animas" ($750). 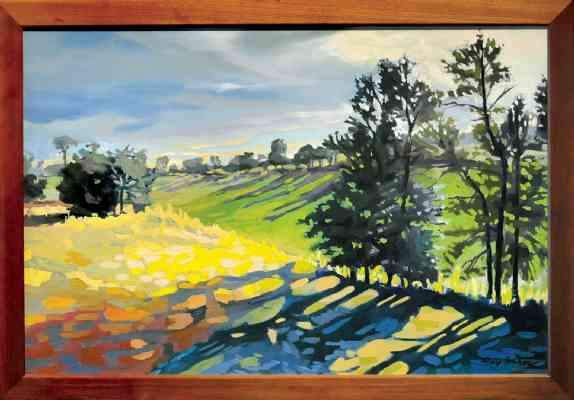 This is the big annual outing for the region's active gang of landscape artists, and they're making the most of their chance to show off.